Identification: This species possesses a translucent-gray body covered with minute flecks of white that impart a distinctive granular appearance not found in other Hawaiian Phyllidiids. The simple tubercles are evenly distributed across the notum. The larger ones are tipped with bright yellow and ringed with white basally while the smaller ones are tipped with white. There are two meandering, lateral black lines with extensions running to the margin. A few black spots are scattered on the notum with more being found marginally. The mantle margin possesses an irregular yellow edge. The rhinophores are yellow and the oral tentacles are white with yellow tips. 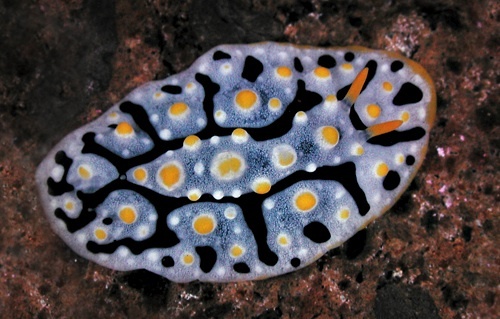 It can be distinguished from the much more common Phyllidia varicosa by its more isolated tubercles, granular appearance and yellow mantle margin. Natural history: Phyllidia exquisita is a moderately rare species found in cracks and on shaded walls and slopes. It is found in exposed locations from 8-23 m (25-75 ft). It was twice observed feeding on a thin orange encrusting sponge. Distribution: Big Island, Maui, Kahoolawe, Oahu and Kauai: widely distributed in the Indo-Pacific. Taxonomic notes: First recorded in Hawaii from Molokini Islet, Maui by PF on Sept. 10, 1988. Photo: PF: 36 mm: Molokini Islet, Maui; June, 1999.